It has ended for Tyrone Power as it began eighteen years ago on the studio lot at Twentieth Century Fox, with Henry King assigned as director of the Power film, “Untamed,” with Susan Hayward and Richard Egan in co-starring roles. With the completion of the CinemaScope drama filmed in DeLuxe color in South Africa, Tyrone Power wound up the very long-term contract with a score of 39 of his 42 pictures filmed at this single studio, the Henry King directed “Lloyds of London” being his first starrer. “I wouldn’t have stayed there as long as I have if I hadn’t liked the place and, having been there so long, I think I’d be a very strange man if I could say goodbye to all that without some sense of loss. “ One thing that has made the divorcement easier, he pointed out, was that a studio working force is a shifting group of men and women. "After all, it's the people and not the buildings with whom you form ties," he said, "To be sure, Darryl Zanuck, who gave me my first break, is still head of the studio, and Henry King, the director of my contract-ending film. But there aren't a great many left like that." Tyrone feels, however, that his affections may have caused him to tarry longer at Twentieth Century-Fox than was professionally advantageous. A studio rarely lets an actor try all types of roles from drama and romance to high comedy. With his initial success in the stage tour of "John Brown's Body," and the current stage presentation of Christopher Fry's "The Dark is Light Enough", Ty is well launched on a new artistic adventure to give full play to his expanding abilities. 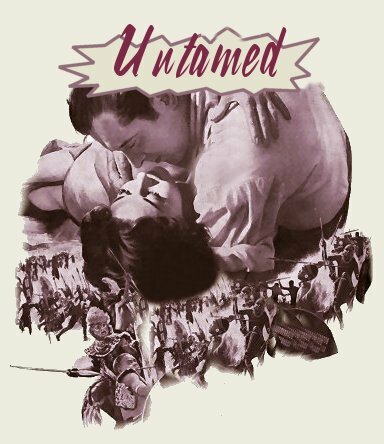 Meanwhile, in his last for the home studio, he is knee-deep in the kind of adventure drama that made him a star, portraying a Boer frontier fighter who is pursued both by warring Zulus and the fiercely loving Susan Hayward.